I painted that! I can't believe it! I'm trying to learn how to paint currently, so my husband and I had a date night at a "social studio." Basically the artist walks you through the painting step by step and you paint making it your own. It was a great night! And I am so happy with my picture! I can't believe I painted that. The studio I went to is called "Bottles 'n Brushes." Yes! That's it exactly! 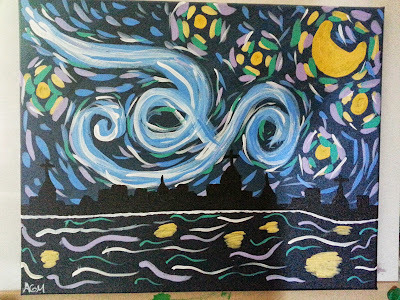 I suppose I should have put up the title: Starry Night (over Charleston). Wonderful paining. Maybe you have a new career ahead. Thanks! I don't know about that, but I am loving getting creative with painting. It has become a new hobby that I had no idea I would enjoy as much as I do! That's awesome! A really creative theme! Very cool! What a fun activity to do together. Thank you! It is hanging in my living room now! Thanks! I put all of my favorite one in! that is such a neat thing to do with your spouse. Happy WW! Looks good. It really was. It was kinda cool to see how we different in vision and in painting. They both came out great though! My sister and I did a course like that before. The paintings turned out really nice. It is so much fun! Those courses are awesome! And thanks! They are SO good!! I can't paint at all, so I would totally love to go to one of these!! Yes! They do such a good job instructing that you don't even realize you are making a masterpiece! I would recommend going if there is one near you! Oh my goodness you are awesome! 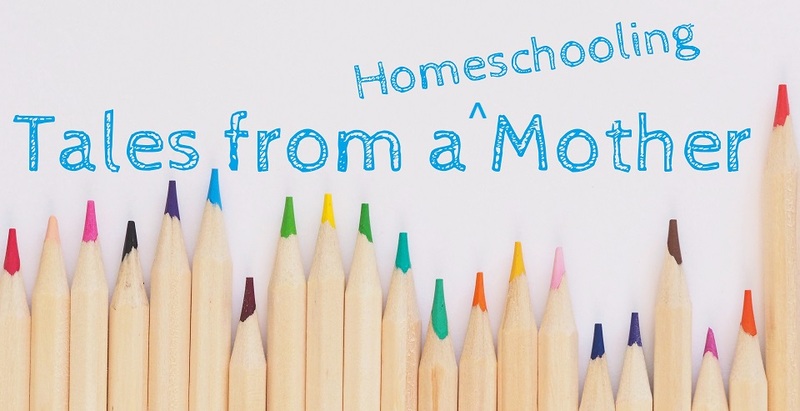 Thanks for linking up at our Hop today. I just linked up here also. Also your newest follower. Hi! Thank you for linking up as well! Amazing - well done both! Thanks! We both has so much fun! How fun! You did great. What a great opportunity! I think you did a great job! Congratulations! You did a great job! I can't believe I took Art classes in high school! :) Mark you, they did not last very long. Thanks for co-hosting and enjoy the rest of your Wednesday. we used to go to pottery classes with my husband and we both loved it!!! Wonderful painting!!! you should be proud! So cool! I went to a place like this about two weeks ago with friends. I had way more fun than I would have imagined possible! SO much fun with such a great take home! That looks awesome - great job. I can't even draw stick people!! 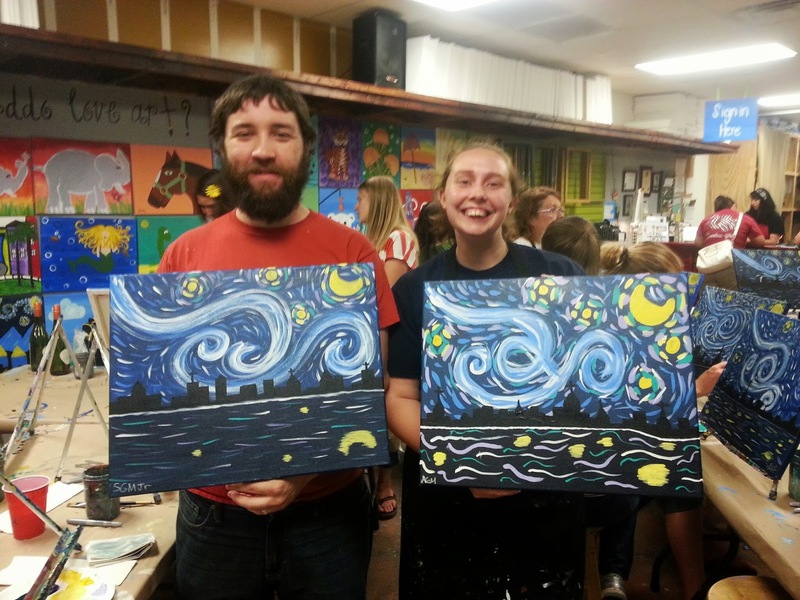 ; ) Such a fun and different date night, even though I'm horrible at art, it still would be a blast. Thanks for linking up to The BOAT! Wonderful paining. SO much fun and cool! !